L-R: Sisters Losana and Vani Bainivalu play for the Fiji U-16 women's team. Vani and Losana Banivalu were born almost exactly two years apart, with only three days between their December birthdays, but they could easily be mistaken for twins. 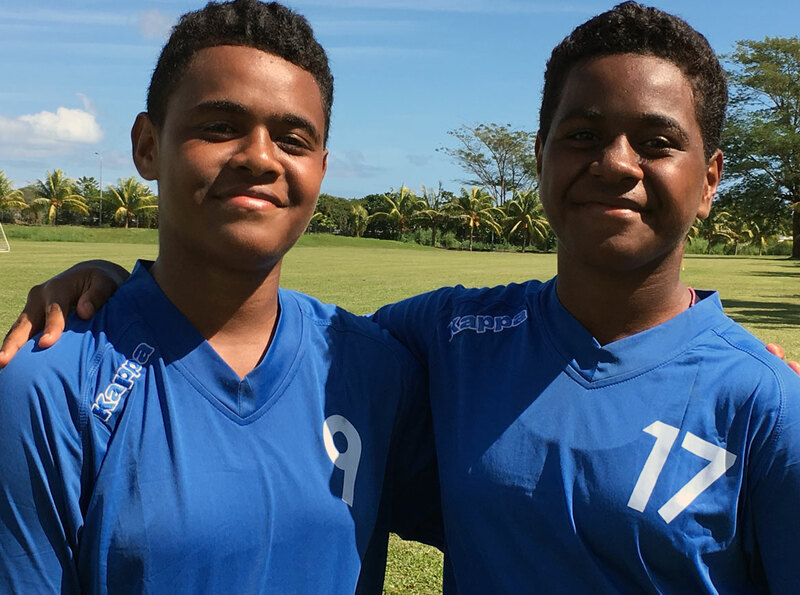 The sisters from Nausori are representing Fiji at the OFC U-16 Women’s Championship this month and although they have quite different personalities feel lucky to be enjoying this new experience together. “It’s a bonus for us to be in the team together because we’re good friends. “Most of the time we get along well, but sometimes we do fight,” Losana laughed. For Losana playing the big sister role is important. “She’s the youngest player in the team so I know I have to look out for her,” she said of her 13-year-old sister. Vani said her big sister’s sense of humour has been key to quashing her nerves. Losana is yet to have a run in her favoured left wing-back position while Vani, a striker who prefers the left, has seized the opportunity to come off the bench for both matches so far and going so far as to score against American Samoa. Although they haven’t spent as much time on the field as they would have liked, just being in the national team environment is an experience to relish. “It’s a big challenge for us to be in the national team and here in Samoa,” Vani said. Both believe the level of football they’ve seen and experienced so far in the competition is higher than what they’ve previously played. “We’re in a tough pool,” Losana said. As well as concentrating on the competition and advancing as far as possible, the pair have also enjoyed watching some of the competing teams. “We like watching New Zealand,” Losana said, “but also Tahiti and Cook Islands.